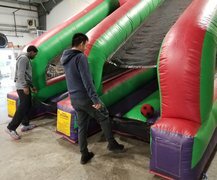 Inflatable Event Professionals brings the fun to any party with Tacoma's best interactive game rentals. These games are a great way to bring your guests together with great competitive fun! 2018 brings some great new additions to our eclectic inventory. We're so excited to bring you our Wrecking Ball. 4 players stand on pedestals and attempt to knock their opponents off of theirs. This game is HUGE and will be the highlight of any event. With its eye-catching color and design, your guests will be immediately drawn to this fun inflatable game. Another amazing item for this year is our Galaxy of Games. 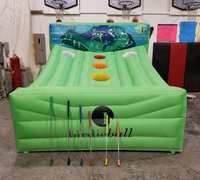 This inflatable provides 3 games in 1. Game 1 is a classic with a twist. Human Hungry Hippo! Yup, that's right. But this time, you get to be the hippo. The second option in our Galaxy of Games is Tug and Dunk! Up to four players. Two players are attached to each other at opposite ends of a bungee. They pull against each other and attempt to dunk their basketball. COMING SOON: The third game is "Lights Out". A set of lights randomly illuminates in front of each player. The player must touch the light to turn it off and score a point. Doing this while attached via bungee to your opponent pulling the opposite direction. The team with the most points wins. All of these fun, competitive games will be sure to build up quite an appetite for your guests. Be sure to take a look at our concession machine rentals. Also, a great addition to any of our interactive game rentals are our obstacle courses. With such a large selection, you are sure to find an inflatable obstacle course to fit your needs. From back yard birthday parties to large events like school field days, church events or company picnics, obstacle courses are a great choice for kids and adults alike. 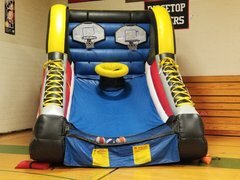 Also, our exhilarating bounce houses & slides will turn your party into the best party in the neighborhood! Combo bouncer rentals give you the best value for your rental purchase along with the maximum fun packed into one inflatable. Browse the selections below and click on the title or image for more information and to make a reservation.